As New Music New College begins our eighteenth season, we look back at how Sarasota has embraced our efforts to bring new, adventurous, and experimental art to our community, and we also look forward to the possibilities of the future. 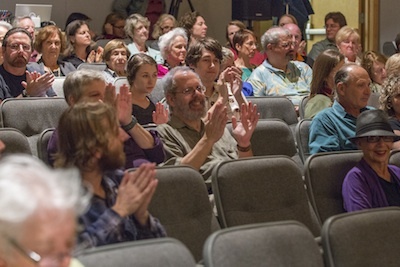 Over time our offerings have grown in number and scope—from our first one-off performances of John Cage’s Song Books and Pauline Oliveros’s Sonic Meditations, to more frequent concerts, to bringing in visiting artists, to creations of new experimental works, to our five-concert series, to partnerships with institutions like The Ringling and the Sarasota Orchestra, to our Artist Conversations, to workshops, to demonstrations at Booker/VPA High School, to our pre-concert talks, and now to mini-residencies. We are constantly self-evaluating and questioning: where shall we explore next, how can we better serve New College and the greater Sarasota community, how can we more effectively present the new and the unknown, and how can we deepen the conversation with our audiences and artists? We believe in the power of contemporary music to open our eyes and ears to new perspectives, to foster a community that values diverse experiences, and to help us imagine new possibilities, even as we acknowledge our historical roots. Of course, these are the virtues of a liberal arts education; they reflect NMNC’s identity as a vital part of New College of Florida. Beyond our public performances, New Music New College functions as a laboratory for interdisciplinary research, leading to new curricular offerings, presentations by students at international colloquia, and publications in major journals. We offer opportunities for New College students to compose, perform, and work with some of the leading practitioners of contemporary music around today. We are a crucible for new experimental works and alternative means of performance, always ready to challenge ourselves and our audiences, whether it be by presenting work deemed too radical by others or by playfully disrupting the traditional performer/audience hierarchy. We see NMNC as a bridge between the college and the Sarasota community, a site where we all can interact, converse, and question what is music, what is art—and at heart, what makes us human. Are these lofty goals? Yes. But the continued support of the community and of New College has meant that we can take on such challenges and keep ourselves a vital place to experience the new. We ask you to deepen your involvement in NMNC and work with us as we look to the future. The vast majority of our funding comes from supporters like you. And while we do a lot with a little, only an increase in our budget will allow us to plan far enough ahead to take New Music New College to new heights, with cutting-edge performers and composers from all over bringing top-notch music to our community. We are excited about the future, and embrace the possibilities ahead; won’t you join us? Please click here to contribute to New Music New College securely on line, or you can phone the New College Foundation at 941-487-4800. 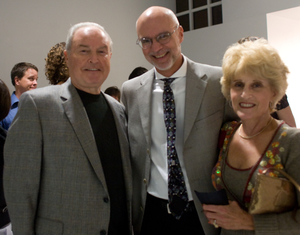 New College Foundation, The Keating Center, 5800 Bay Shore Road, Sarasota, Florida, 34243. We at NMNC sincerely thank you! Any and all contributions are appreciated and will enable NMNC to continue to bring the best of the new to Sarasota and foster our ongoing conversation about music, art, and life.